Thefts of outboard motors and break-ins to boats on moorings were prevalent a couple of years ago. 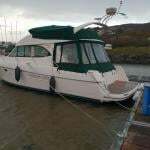 My own boat suffered nearly €6,000 of damage and theft when it was broken into on the mooring at Crosshaven in Cork Harbour during that spate of robberies. An alert, dedicated Garda detective in Cobh on the other side of Cork Harbour recovered some of the items when he located the culprits. "This week three outboard motors were recovered in Kinsale"
This week three outboard motors were recovered in Kinsale thanks to a member of the public who spotted two men acting suspiciously near the water’s edge at Scilly. 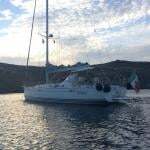 They fled, leaving behind a dinghy with three outboard engines in it. Gardai, called to the scene, discovered that attempts had been made to remove engines from two other boats in the harbour area. "Garda advice is to lock-up your equipment"
That has led to a timely reminder from Gardai who observed that the boating season seems to be starting earlier ever year, urging owners to protect their equipment. Some owners told me after my boat was broken into, that they leave their hatches unlocked on moorings to avoid any break-in damage, but I wonder what about equipment aboard cruisers? The Garda advice is to lock-up and mark your electronic and other equipment. Use your Eircode or some other marking that cannot be removed and take a photograph of the equipment and its marking. Good advice….and that was one of three stories which stand out for me this week ….. The name change forced on the organisation which has done great work in water safety is another and then there is the battle on Dalkey Island off South County Dublin. John Leech, a well-known and experienced race officer and sailor, who is also Commodore of Lough Derg Yacht Club, is Chief Executive of Irish Water Safety and very devoted to the protection of life in the water…. He told me this week that his organisation is changing its name and that is all because of Irish Water. • Listen to John Leech on the Podcast below as he explains this. So, onto Dalkey Island where BirdWatch Ireland and the Royal Society for the Protection of Birds, are currently baiting rats under the EU-funded Roseate Tern LIFE Programme to protect seabirds. It’s not the only island on the East Coast which has a problem with rats and funding to remove them hasn’t been easily made available. “If we can keep this island and its satellites rat-free, then other burrow-nesting and crevice-nesting species could potentially settle there,” Dr. Stephen Newton, Senior Seabird Conservation Officer at BirdWatch Ireland, told me on my radio programme, THIS ISLAND NATION and added:” Who knows, we might even one day have Puffins nesting on Dalkey Island?” Non-toxic bait and ‘flavoured treats’ in combination with trail cameras will also be used to ascertain whether the rates have been got rid of. • The Podcast below has more details of the brown rat menace to inshore islands on the East Coast.